When your child is diagnosed with Type 1 Diabetes there are so many things that go through your head. First of all, frame of mind depends on how your child is diagnosed. My grandson Cooper was 22 months old, had been sick all week, had been to the Pediatrician twice, who had ruled it the flu. To make a long story short, when Cooper refused to walk, complaining that his legs hurt, we went to the ER at Children’s Hospital. My daughter had told her Pediatrician that her son had one of two things, either type 1 diabetes, or leukemia. The symptoms are similar. My grandson was in the PICU for 3 nights, close to death. I remember the feelings of “are all of his dreams for the future gone? Will he still be able to play sports if he wants to, or will he stand on the sidelines and watch? It’s a true feeling of despair because until this point, we didn’t know anything about type 1 diabetes, except that it does not have a cure! We all have different feelings when our kids are diagnosed. You go through a multi-step process of feelings. Because Joey was diagnosed in our living room by my daughter and son in-law Andy, our first feeling was plain out shock. When Andy asked Joey to let me use him as a guinea pig, because I was going to babysit Cooper later that week, the furthest thing from our minds was that we’d have a diagnosis on our hands. Thank God that Joey reluctantly agreed, because with his blood sugar measurement at 466 we were very close to his body getting very sick. I couldn’t wrap my brain around what had just happened. So we went through shock, fear of the unknown, sadness, worry – about how to pay for this disease that needs new supplies monthly, confusion during Diabetes 101 class. It’s also like a whirlwind, it happens so fast, from diagnosis to the first shot, all the while I was thinking “why? How? We already have a child in our family with type 1.” Thankfully, after a few weeks, my thoughts turned to “okay, I can handle this challenge. If Joey can be as brave as he has been, then how can I sit here and have a pity party, although I felt like having a pity party!! So it’s been 4 years since that day in May of 2009. We still have our fears of the unknown, like those scary low blood sugars that may creep in at night. People say, “why do you check his blood sugar at night?” Truly, type 1 doesn’t sleep, we check Joey’s blood sugar every few hours during the day, why shouldn’t we do the same at night? This picture may explain it better than I ever could. 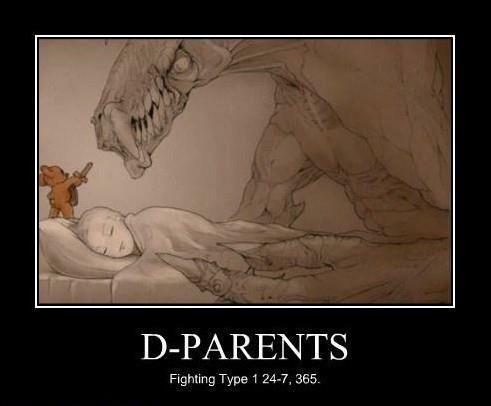 It’s the big bad monster that hovers over our kids 24-7, which brings us anxiety, fear, sleepless nights. But, with that being said, we are so proud of Joey, he doesn’t let type 1 hold him back from accomplishing his goals, so we need to support him and put our fears aside. Joey has taught us to be optimistic, calm, fearless, and grateful for his good health and great attitude. This is representative of how we worry about nighttime blood sugars. After the 466 blood sugar, I had called a friend of ours, Bill, a pediatrician. He advised against the hospital that night, with the Swine Flu rampant, why take the chance of Joey getting sick on top of Type 1. Plus, I had Joey’s 8 year old check up already scheduled for the very next day. The moment of truth had come, Joey’s doctor came in and looked at us, she even had tears in her eyes. “Yes, it’s confirmed, Joey, you have type 1 diabetes.” I tried with all my might not to cry, but my eyes were so swollen from crying all night that it was hard not to let a few tears out. Joey also teared up, because he knew what was in store for him, having a nephew with the disease. On Tuesday we were sitting at the Endocrine office at Children’s Hospital, we had two days of classroom training, with Joey along. There were others in our class, a 16 yr old boy, and a toddler. The parents all looked tired, and scared. By 11:00 am we had given Joey his first shot. We returned on Wednesday for day 2 of class. Joey missed Monday and Tuesday of school and half a day on Wednesday. I wanted to keep him home all week, but Wednesday afternoon was the beloved Spring Concert rehearsal, that he didn’t want to miss. That evening was the actual concert for the masses. The concerts are so popular, standing room only in a church that holds 3000! I was proud of him for being so brave. I was feeling terrified, what if his blood sugar feel low? Because he was newly diagnosed, we were guessing at how much insulin to give him. It was a sliding scale, but really went off his weight, height, and A1C result. Basically, I felt as though anything could happen. As we walked into the church that day for practice, it was like everyone was staring at us. That’s the feeling I had. At the time of Joey’s diagnosis, he was #5 students with t1 at his school of under 400 students. That seemed like a lot to me, and as it turns out, it is a lot. We hadn’t been officially back to school yet. So when we walked in for the concert rehearsal, all the kids cheered, and asked Joey if he had diabetes. Joey denied all claims. I was shocked that word traveled that quickly. I told a few friends at school, but couldn’t believe that everyone seemed to know. After we got home I asked Joey how he wanted to handle his return to school on Thursday. We decided together that it was best if we go in there armed with information for the kids. We sat down together, had his Rufus teddy bear, and the book by the same name, called Rufus Comes Home. It’s about a bear that has Type 1. The boy in the book is about the age Joey was at diagnosis. The kids loved the book. We then showed them Joey’s meter, and the syringe. We feel like this was the best way for our family to tell his story to his classmates. Some kids don’t want anyone at school to know about their type 1 diabetes. A year after Joey’s diagnosis a friend called and asked if we would meet a family, their son was recently diagnosed, and they didn’t tell anyone about it. The parents were concerned that their son was keeping it a “secret” from all his classmates, and it created a lot of stress on the child. As the afternoon went by, Joey was very open about testing his blood sugar in front of everyone, after-all, it’s how he has been from the beginning. The mom seemed so concerned about her son, because it was like he was ashamed of Type 1, he wasn’t ready to accept it yet. Everyone has their own way of handling the devastating diagnosis of type 1 diabetes, and it comes with so many different emotions. One thing that we know for sure is that it takes a village to help raise a child, and to us that means that the village has to be educated about the symptoms of the lows, and highs of the disease. It gives us great peace to know that everyone knows about Joey’s disease, so they can be on the look out for behaviors that might indicate he is in trouble. We are blessed to have such wonderful people in our lives.